The Mini Festival of Japanese Traditional Performing Arts takes place March 22 at Furman University. The day begins with sumi-e brush painting, Japanese calligraphy, kyudo archery, ki-aikido, sushi-making, and Japanese tea ceremony all taking place at various locations on Furman Campus (see Furman Campus Map), from 3pm to 5pm. The keynote performance at 7:00pm will be an incredible traditional puppetry performance by Tondo Puppet Troupe from Nagahaga, Shiga, Japan, visiting South Carolina for the first time, in their first of only four public performances. 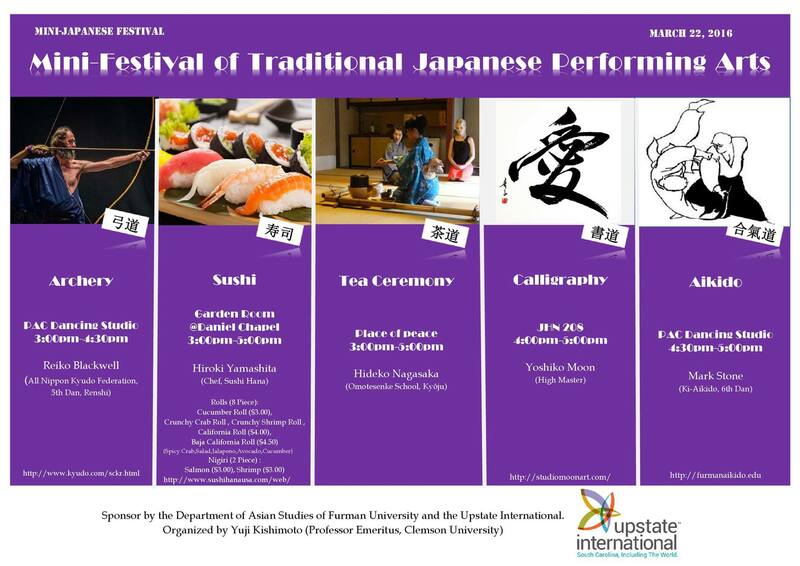 Yuji Kishimoto, Professor Emeritus of Architecture at Clemson University, is organizer of this festival and the driving force behind bringing the Tonda puppet troupe to SC for Upstate International Month 2016. This great article by Erikah Haavie has more information about Tonda Puppet Troupe and their upcoming performances: Renowned Japanese Puppet Troup Performs March 22 (Furman University). Sushi Making demonstration with Chef Hiroki Shimashita of Sushi Hana will be held 3-5pm at Daniel Chapel in the Garden Room. Sushi will also be available for sale. Japanese Calligraphy and Sumi-e Brush Painting demonstrations with Yoshiko Moon will be held 3-5pm at Johns Hall Room 208. Aikido and Kyudo Archery Demonstrations will be held 3pm-5pm at the PAC Physical Activities Center, second floor, Dance Studio. Bunraku Traditional Puppetry Performance with Tonda Puppet Troupe of Japan will be held 7pm at McAlister Auditorium on Furman University Campus. Tea Ceremony demonstration with Mrs. Nagasaka will be held 3-5pm in the Place of Peace, an authentic Japanese temple given to Furman by the Tsuzuki family of Nagoya, Japan.